David Korinetz grew up in Winnipeg, where he was employed in the Aerospace industry for 19 years. In 1993 he packed up and moved to Vancouver Island, where he began a new career in the software industry. His travels finally brought him to Penticton in 2000. While working there as a computer programmer, he decided to try writing in his spare time. This decision would ultimately and forever alter the course of his life. The catalyst that made David's dream of being a Fantasy writer become a reality was his enrollment in a Writer's Digest correspondence course in 2002. His instructor, Steven F. Havill, taught him what POV (point of view) means, why stories have plots, and more importantly, how to make an outline. Armed with this new and invaluable knowledge, David spent the next four years of his life writing, rewriting, and ultimately publishing his first fantasy novel, FireDrakes (2007). In 2009 David published his second book, Sorceress, and then started Red Tuque Books, a book distribution company for Canadian authors and publishers. His third book, Halfling, was published in 2011. In 2015 David released Warlock, the fourth novel in his Daemon Knight Fantasy series. What has David been up to? 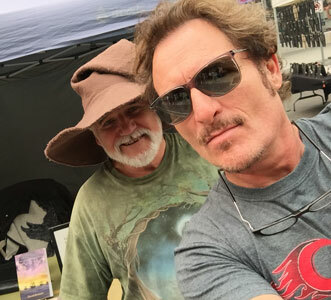 David met Kim Coates at the Penticton Saturday morning market, where the actor took this selfie in front of David's booth. They talked a bit about Kim's role in Sons of Anarchy and his CBC Bad Blood series. To David, Kim seemed like a real down to earth nice guy, and not at all like the 'gangster killer type' he tends to portray on screen. David attended the first annual Penticton Comic Convention, held Saturday, July 8th, at the Penticton Lakeside Resort Hotel. This was a fantastic sold out event. David was awarded the 2016 Literary Award during the third annual Penticton And District Arts awards, held Thursday, February 18th, at the Shatford Centre. This was a wonderful night of food, wine, entertainment and of course, the awards. The Literary Award was sponsored by the Penticton Herald. David visits KVR Middle School to talk with the grade 7 students about writing and publishing. Thanks to Yasmin John-Thorpe, and the South Okanagan Raise A Reader program, each student selected one of his books to take home with them. David visits Summerland Secondary to talk with the grade nines about Fanatasy writing. David visits the Osoyoos Elementary School to talk with the grade 6/7 students about writing and publishing. Thanks to the Penticton Herald South Okanagan Raise A Reader program, each student received one of his books to take home. David visits Skaha Lake Middle School to talk with the grade eights about writing and publishing. David presents Shane Koyczan with the Penticton And District Art Council's Literary Arts Award. This wonderful event which celebrates outstanding achievement in the arts was held at the Shatford Centre, on February 27th, and was emceed by retired CBC broadcaster, Bob Nicholson. David's distribution company, Red Tuque Books, was the sponsor of this 1st annual Literary Award. David being interviewed at Penticton Secondary by Shaw TV for Go Okanagan during a Raise-a-Reader visit. David shares what he has learned about writing and publishing with some of the English students. Mike Plested interviews David for 'Get Published'. They talk about David's books and his Canadian book distribution company, 'Red Tuque Books'. David at another Raise-a-Reader author event. This time at Princess Margaret Secondary, where he shared what he has learned about writing and publishing with the grade 9, 10 and 11 English students. Each student received one of his books to take home. David, being interviewed by Shaw TV for Go Okanagan at the Authors & Artists Christmas Faire. David talks about self publishing, his Canadian book distribution company, Red Tuque Books, and the Canadian Tales writing contest. David attending a Raise-a-Reader author event at Oliver Elementary. He discussed Fantasy writing and publishing with the students. Each student received a book of their own to take home. David, being interviewed by Kevin Schilter for WindWard TV. David talks about his novels, his Canadian book distribution company, Red Tuque Books, and using WindWard software to handle consignment issues. Dave, in the school library at Penticton Secondary, talking about writing and publishing with the students. This event was sponsored by the South Okanagan Raise A Reader program. Dave poses for a picture with Meg Tilly at Hooked On Books during her visit to Penticton. She was one of the instructors at the 2010 Penticton Writers And Publishers Youth Write Camp. Besides the Youth write Camp, Penticton Writers And Publishers also sponsors an annual Young Writers Contest. For more information about these events click here. Dave poses with one of three grade 8 classes he visited at South Okanagan Secondary this year. Raise A Reader sponsored the visits and provided a book for each student in the class. This 'books for kids' aspect of the South Okanagan Raise A Reader program is the brainchild of Yasmin John-Thorpe who also manages the program. Dave is busy with Raise-a-reader events again. This time at McNicoll School. He discusses writing, publishing with the children and reads from his book. Each child is given a copy of their own to take home. If you would like to have a visit from Dave please click here. Dave talked about fantasy writing and read to the students at Skaha lake Middle School. POWERED BY THE C4Wise Design | Copyright © David Korinetz 2017 All rights reserved.